In a small saucepan of boiling water, blanch carrots, zucchini, and asparagus for 2 minutes, add peas and cook for 1 minute more, Drain, and place in large serving bowl. In same saucepan, heat 2 tablespoons of olive oil and gently simmer garlic cloves with pepper flakes over medium heat for about 3 minutes until garlic is just colored. Add the oil, garlic and chili flakes to the vegetables, and toss. Bring a large saucepan of well-salted water to a boil, add fregola and simmer until al dente, about 8-12 minutes. Drain, and add to vegetables in bowl along with cherry tomatoes and cucumbers, cut. Mix lemon juice or vinegar with salt and EVOO until emulsified. Add to fregola and vegetables and toss. Add Ricotta Salata, chopped herbs, and prosciutto or soppressata if desired and toss again. In a small saucepan of boiling water, blanch carrots, zucchini, and asparagus for 2 minutes, add peas and cook for 1 minute more, Drain, and place in large serving bowl. In same saucepan, heat 2 tablespoons of olive oil and gently simmer garlic cloves with pepper flakes over medium heat for about 3 minutes until garlic is just colored. Add the oil, garlic and chili flakes to the vegetables, and toss. Bring a large saucepan of well-salted water to a boil, add fregola and simmer until al dente, about 8-12 minutes. Drain, and add to vegetables in bowl along with cherry tomatoes and cucumbers, cut. Mix lemon juice or vinegar with salt and EVOO until emulsified. 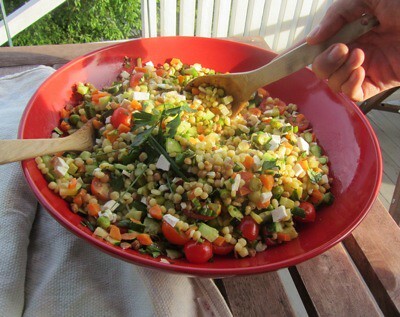 Add to fregola and vegetables and toss. Add Ricotta Salata, chopped herbs, and prosciutto or soppressata, if desired, and toss again.